FRTB requirements from the Basel Committee are centred around proactive measures to ensure another financial crisis doesn’t occur. What we saw with the 2008 financial crisis is that a top-down pricing approach to complex OTC instruments could be misleading. Instead of bunching financial instruments and pricing the whole ‘basket’ or ‘packaged offering’, as per the previously acceptable process for financial firms with collateralized debt obligations in the U.S., FRTB ensures firms look at all the individual trades from at least the past year of each financial instrument and accurately price from the bottom-up. FRTB strengthens liquidity requirements and with it more data is needed to be compliant with valuing these complex financial instruments. At the time of this article, the final Basel Committee on Banking Supervision (BCBS) FRTB rules outlined in January 2019 are anticipated to take effect January 2022. Here’s a rundown: if firms meet certain data retention and calculation requirements (explained later on) to prove the prices of their financial instruments are accurate in their book, they are able to have their instruments become “modellable”. Modellable financial instruments have significantly lower and more flexible liquidity requirements. By seeing if their traded financial instruments are modellable, financial firms are able to better leverage their capital. Profits stem from having more capital available for investments. Naturally, the more data is pooled from different sources, the more instruments that can be calculated as modellable. Over the past year we have worked with a number of firms and a variety of OTC data in different asset classes ranging from Bond to Swap instruments to ensure that they could all be managed in our platform as enormous pools of data. Throughout the entire data transfer process, in-flight and at-rest encryption is ensured as well as data storage in a secure environment. Sensitive information is redacted in the pooled datasets and records are matched against each other to provide each participant back with a report describing a much larger pool of modellable instruments they can trade with. Let’s take a specific example of how this all works: aggregating bond data from different sources and performing matches on the issue-level by CUSIP fields, TickSmith’s Data Pooling platform is able to prove modellability for a larger set of bond issues than any single organization attempting to use only their own data to determine their modellable instruments. 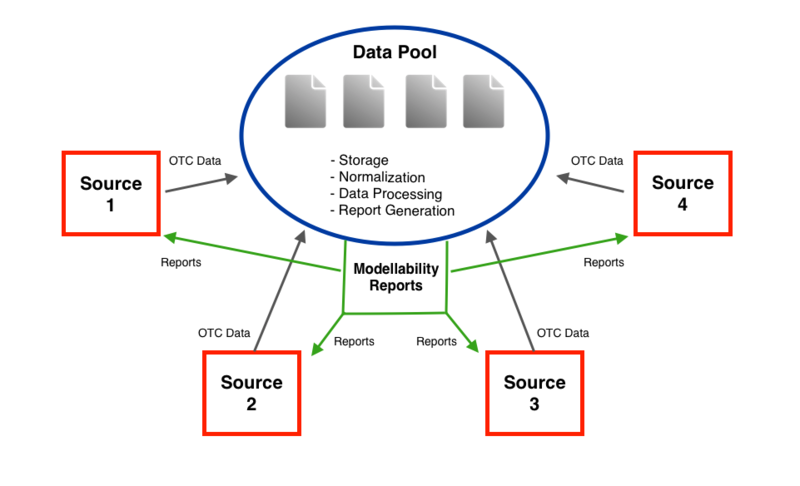 With this larger pool of modellable issues, organizations that have participated in the data pooling process can trade more bonds at much lower capital charges. Unlike the equities market and some sections of the derivatives market, OTC data is messy and unwieldy. There is no defacto “standardized format” that all organizations will adhere to. There are some resources out there that attempts to provide this standardization like the FpML format (Financial products Markup Language) based on Extensible Markup Language (XML) and ISDA Taxonomies but the specifications are complex and, from what we have experienced, all institutions still have different interpretations of these files. For our FRTB Modellability module we have created data models per OTC asset class. Working closely with multiple data providers in determining this standardized format has helped us create a platform that normalizes the OTC data, processes aggregate statistics, exposes granular queries on the data via APIs, and most importantly, calculates modellability reports. The TickSmith platform has calculated the universe of modellable instruments each participant individually had and compared that to what they have now with data pooling. Within the bond asset class, one participant in particular has seen a dramatic 626.61% increase in the number of modellable instruments they can trade with pooling. Note that this increase uses the universe of bonds that the participant already trades within the past year! The pooling of transaction data, prices, and committed quotes in TickSmith’s platform significantly increases real price observations to support FRTB and reduce regulatory capital costs. Once the data is normalized and properly prepared, TickSmith’s Data Pooling platform begins processing tasks to provide statistics and predictability where a security may fall out of or into the modellability category. The platform uses Big Data parallel processing capabilities to efficiently provide participants with the right reports. Statistics as well as the modellability of instruments are precalculated with parallel computation enabling fast queries on a user interface or with an API for users who want programmatic access to the data. I hope you learned more about FRTB today and we’ve tackled your risk concerns. 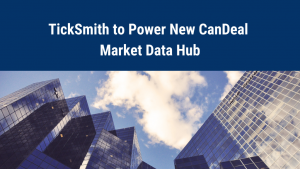 At TickSmith we aim to meet your risk needs with expertise on the intersection of capital markets and Big Data technologies. With your data already organized and made usable by our Data Pooling platform, your firm will be able to derive much deeper business insights. You can do it, we can help!